C++ game development is strongly linked with Unreal Engine 4, one of the most popular and widely spread C++ game engines. It is no surprise that we are getting lots of requests about UE4 setup within CLion. In this blog post we’ll share our own experience along with a couple of tips and useful links. The story started some time ago when one of our team members decided to try UE4. At that time CLion relied heavily on CMake project model (now it’s also Gradle and compilation database options), so it was crucial to get a CMake-based UE4 project. 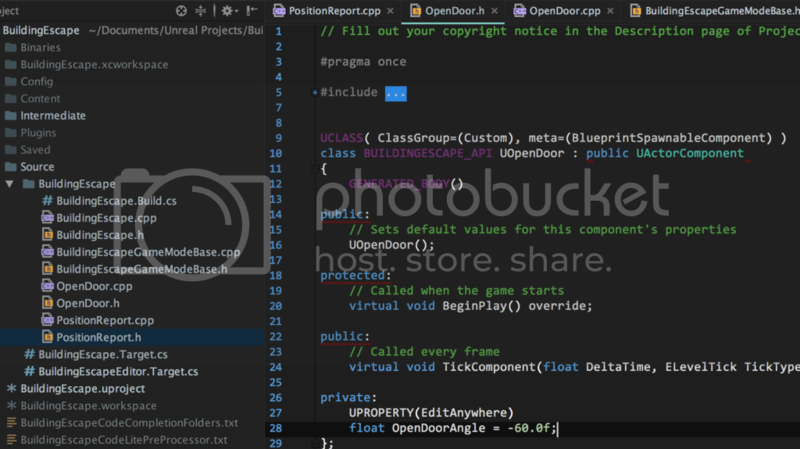 The official Linux-only CMake generator for UE4 projects had existed for some time, but it wasn’t perfect and more importantly, limited to Linux. Philipp Smorygo from the AppCode/CLion team investigated the source of this problem and contributed to Unreal Engine repository with his CMake + UE4 changes. You can read about his experience in his own blog. Good news! With Unreal Engine v4.20 the things became much easier – Unreal Editor can now generate CMake project and open it in CLion in a couple of clicks! Register at Epic Games and download the Epic Games Launcher. Run it and let it download all the necessary Unreal Engine 4 binaries for you. Create or open your project with UE4 Editor to generate an *.uproject file. Download and install Mono to be able to launch on Linux and macOS. Now you can call File | Open CLion, use CLion for your UE4 project and enjoy all of its features! Bu the way, don’t forget to build your Unreal Engine project to get all the generated headers ready, otherwise the IDE won’t be able to resolve some symbols in your project. Plugin also generates custom targets for building and cleaning your game. Fake target is added for CLion needs to make all the intellisense possible. Our experience shows that initial indexing time is acceptable, as the CMake project model generated this way allows CLion not to index and build symbols for the entire engine source, but only for necessary engine headers and source files. However, we still recommend that you increase the amount of memory used by CLion, or at least check the real usage by switching on the memory indicator (Preferences/Settings | Appearance & Behavior | Appearance | Show memory indicator). Unreal Engine generator produce CMakeLists.txt with the incorrect escaping sequence (it’s underlined with red in the CLion editor): use \\ instead of \U in the top-level CMake file. Sometimes you might get CMake loading error (command line is too long): it is related to the MSVC bug (CPP-9026) and is fixed in VS 2019 Preview. We’ll appreciate your feedback on the whole workflow! Let us know in the comments section below. This entry was posted in Tips'n'Tricks and tagged CMake, Gamedev, Unreal Engine 4. Bookmark the permalink. Thank you VERY MUCH! Exactly what I need – instruction for all tools in one place. I work at Epic and use CLion. I’d like to make sure support for CLion is good. Please contact me using the address provided. It’s nice. Currently, on Linux it looks like the plugin doesn’t update the CMakeLists.txt to include classes created through the Unreal menus. I’ve been using that method for awhile without issue. I just don’t know if UHT still generates the same CMakeLists.txt, as the plugin. That’s interesting, thanks for the feedback. We’ll share with the plugin’s author. CMakeLists.txt generated by GenerateProjectFiles.sh is totally different from one created by plugin. As far as I found out, the plugin can rebuild CMakeLists.txt manually. Check File -> Generate CMakeList item in UE4 Editor menu. Are you planning to introduce support for other game engines such as Unity and CryEngine? CryEngine works out of the box, since it’s a CMake based solution. Unity is on C# so it’s for Rider/ReSharper more than for CLion. Looks like the performance definitely improved in the new EAP when reloading changes for CMakeLists.txt – thanks! I’m currently looking for workarounds. I did get CLion working with UE4 a while back by doing some tangential UnrealBuildTool edits to those suggested in Philipp’s very helpful blog post – except of course there were performance issues to deal with (which appear to be fixed now). Probably I’ll try getting it to work this way if modifying the plugin to generate CMake files with less targets doesn’t help, etc. Thanks for the comment. The problem doesn’t depend on the way you use to generate CMake for UE4. We need to check if it’s really a regression or not first. By the way, have you tried encreasing the xmx value (not xss)? Also do I need to manually paste plugin to every game project? Can’t I have once in all solution? If you are building symbols first time ever it takes quite a lot since UE4 files need to be indexed. Reopen will work much quicker of course. CLionSourceCodeAccess is made as a per project plugin. However you can completely skip it if you have a CMake project for your game already. Tried it some days ago on Windows. It seemed to work until I realy clicked “Open CLion” (so building the plugin worked with some workarounds before, which I commited to the plugin repo). But this is by far the best try I had in setting up clion for unreal. That’s interesting. We’ll check a bit later if something can be done and also ping the plugin authors if they can help. Yeah I seem to still be getting this error. I’m using the latest version of this plugin but for some reason CLion refuses to load any includes outside of the project. I’ve commented on an issue on the github for the plugin (https://github.com/dotBunny/CLionSourceCodeAccess/issues/26) with as much info as I can get. I’ve tried going through and converting all the \ to / in all the .cmake includes but that doesn’t seem to yield any differing results. Based on it throwing no such file/directory i’m going to guess that either a folder is missing or it won’t load off of the drive for some reason. The G:\ drive is a windows software RAID 0 array so maybe that is causing issues? I’ve been trying for weeks to get UE4 working with CLion as I cant stand how slow Visual Studio is, even when using Resharper C++ (Which is a great help but I’m much more comfortable with CLion/IntelliJ platform IDEs). I’ll try to check the plugin a bit later. Sorry, don’t have time for this right now, but will do my best to look this week. Need to check your CMake if it’s correct. Or try adding new class through the Unreal Engine and re-generate CMake through the plugin. Does it help? Glad to know it’s working now. So does the UE4 plug-in for CLion actually work as in I can make all of my games with this plug-in? Do you mean a plugin to CLion or to UE? There is a plugin for UE that allows open project in CLion and generate proper CMake. And there is also a plugin to CLion that provides more profound completion. Can you edit this blog & that relevant information on how to do that? Not sure I actually got the issue. If you need to build, just select the configuration and then Run | Build. Can I upload a video of my error so you can understand what exactly the problem is? Yes, thanks. The issue is that CLion doesn’t know which executable to run. The plugin to UE editor simply generates some targets for UE to be built from CMake. These CMake targets can’t be executed, since no executable is assigned to them. To make these targets runnable is an additional feature that can be added to the plugin I believe. What do you want to achieve? Runnable configuration in CLion? Or smth different? Not sure I completely got you. But you don’t need an executable in the configuration to compile. You just need to select the proper configuration and call Build. Can you not post like this? Yes, this is a known plugin issue for Windows (https://github.com/dotBunny/CLionSourceCodeAccess/issues/35). I’ll try to look at it as soon as possible and may be fix. Thank you Anastasia for your reply, I’ll be watching this issue on Github. Are the instructions here: https://github.com/dotBunny/CLionSourceCodeAccess/wiki/Setup still valid? We upgraded to UE 4.15 and cannot get the plugin to compile on linux. Fails with the error “Plugin CLionSourceCodeAccess failed to load because ‘CLionSourceCodeAccess’ could not be found. Please ensure the plugin is properly installed, otherwise consider disabling the plugin for this project”. I can post more details if needed. Has this been confirmed to work on linux for 4.15? Could you please submit this as an issue at plugin’s GitHub repo (https://github.com/dotBunny/CLionSourceCodeAccess/issues)? Did as you asked. Thank you for taking a look. Found a workaround as documented in the issue I opened https://github.com/dotBunny/CLionSourceCodeAccess/issues/45 if anyone else runs across this problem. Could you please share the file where this problem happens or better some sample project to reproduce? I haven’t experienced this problem but maybe it was introduced recently. Unfortunately, I don’t know much about this part of the plugin. I was only contributing to the CMake generation itself. Will try to ping the authors if they have any ideas about the problem. Thank you for this article! But i have a problem: after i downloaded plugin, i created folder in \Epic Games\UE_4.13\Engine\Plugins\CLionSourceCodeAccess (there is all files from repository). Next step, i opened my Blueprints project and take a error “missing or incompatible modules in CLionSourceCodeAccess plugin – would you like to disable it? You will no longer be able to open any assets created using it.” If i choose “Yes” – “Plugin CLionSourceCodeAccess failed to load because module CLionSourceCodeAccess could not be found. …”, else “No” – “Plugin OnlineSubsystem faild to load because module OnlineSubsystem could not be found”. What can i do? Could you please submit an issue to the plugin’s GitHub? The plugin is a 3rd party one and looks like this is a problem with the plugin, not CLion. I guess the plugin authors could handle it or suggest smth to you. So no CLion support for UE4 on linux.. Thanks for pointing to it, we’ll check out with the plugin author if smth could be done soon. Is it possible to share a cached index of UE4 across projects? This will save each project re-indexing. No, it’s not possible for now. And the task is not easy, as you have to match many different libraries location and platforms configurations. I encountered the following problem when setting up my project. I figured out it’s caused by the space inside the path. Is it supposed to be a bug that is needed to be fixed? Using ‘git status’ to determine working set for adaptive non-unity build. ERROR: System.IO.DirectoryNotFoundException: Could not find a part of the path “/home/hyh/Documents/Unreal\ Projects/MyBlankProject/MyBlankProject.uproject”. What exactly goes wrong for you? Could you please provide more details? We need to understand if the problem is in CLion, in UE4 plugin or somewhere else. Could you post an updated tutorial now that CLion support is (nominally) included in UE4.19? It seems to be much different– I think a lot of people could use tips on how to make indexing work, and how to get code completion, debugging, etc. on CLion’s end. I think it would make the difference between using CLion or XCode for a lot of your new/exploratory customers. Yes, we plan to post an update. However, Epic still haven’t accepted the full PR, so the integration is now broken. When the things work, we’ll update. I can’t seem to see anything like Generate CMakeList or Open CLion under File menu in UE 4.19.0 on Windows. I did have enabled the CLion plug-in. Any ideas? In 4.19 unfortunately the integration is broken, as we are in process of migrating the functionality from the plugin to the main UBT process. But since not all PRs were accepted into Unreal code, it’s still not fully available in 4.19. We hope 4.20 will come with the full support. I’ll post the update to this blog post. Stay tuned. The recent news is that UE reported the fix in master, but we haven’t checked it yet. Was this fixed in 4.19.1? Seems no, I guess fix is coming to 4.20. We’ve tested on 4.20.1 and seems the build generation is broken there. We’ve reported to Epic, they promised to check in a while. So i tried this in 4.20 on Windows with the newest CLion Version but it still is pretty broken. I can generate a project and open it, but in the solution it shows no files and no build targets. I created a brand new project from a template using the launcher Version of UE4. The issue is somehow deep in the UE4 code. On macOS it works for example. However, we have to investigate together with the Epic team why there are cases (like yours on Windows) when it doesn’t work. Just to say, I have a few similar issues. The generated Cmakelist.txt file has backslash characters, easy fix and when invalidating caches and restart, CLion correctly picks up the project. Command line error D8049 […] command line is too long to fit in debug record. Seems to be a Windows issue that’s over my head. I’m guessing most of this has already been fixed and is just waiting for review/PR to be accepted. Build Targets seem to exist for me (though they did disappear at some point) but I can’t build anyway. As far as I know at least on macOS the recent 4.20 works fine with CLion, but we are still investigating/testing. There are problems on Windows however. I’m encountering problems with the mac version as well. The generation of the cmakelist and the project works flawlessly, but the autocomplete doesn’t work. Seems like CLion doesn’t index my project source too, not only the UE4 engine source. When I open the project it starts indexing and generating symbols but at the end of the process all the variables are red colored. I tried to Reload CMake Project, synchronize, Invalidate cache, clean my project folder and recreate CLion Project, nothing. Still no autocomplete. It worked great with UE 4.19 and CLion 2017.3 for me. Thank you for letting us know. We’ll check on our side and with Epic and update here. It seems to work much better, though not 100% with UE 4.20 and CLion 2017.3 on mi MacOS machine. At least it seems to successfully find base classes (after a first long long long symbols building process) and all those error red lines have disappeared. Still have problems to find “.generated.h” files. I can make it find my source files generated.h files by including a line in “Intermediate/ProjectFiles/cmake-includes.cmake pointing to my intermediate “.generated.h” files, but it still has problem finding this “.generated.h” files for engine classes. Can you just submit your generated project to https://youtrack.jetbrains.com/issues/CPP so that we check the errors? Don’t forget to share platform/compiler details over there. Tried to get it working now on 20.3 but I still stuck at issues on Windows. CLion can’t load the settings from “misc.xml” – “Error on line 1: Content is not allowed in prolog. Please correct the file content”. Additionally, the project is empty. After changing the file paths (from \ to \\) in the CMakeText.txt the compiler starts but fails. yes, on Windows there are to known issues: with invalid escaping symbols (the pull request is already sent to UE4) and some compiler issue. See the end of the blog post. We are still investigating, but not sure we can resolve it quickly. Can you show the log when the compiler fails (after changing escaping) to validate it’s the same issue? Is it full log? Maybe you can attach it to the issue linked in the end of the blog post? Seems it’s the same issue… Feel free to follow it for the updates. Yes seems to be the same issue. However, I am not really confident with building etc. and therefore don’t know if my setup is wrong in some way. For MSVC (where the issue is just the same) seems it will be fixed in approx Visual Studio 2019 (16.0). There is a link in the ticket. There is an issue with the way how UE4 open the project and CLion treats it – the project was not loaded in your case. I mentioned this problem in the end of the blog post – https://youtrack.jetbrains.com/issue/CPP-14457. As a workaround, you can do the following: close project in CLion, open it again pointing to the top-level CMakeLists.txt (not the directory, but the file itself) and answer ‘yes’ when CLion suggests opening as project. Meanwhile, we hope the fix be ready in one of the upcoming EAP builds, it’s on the way. Hello, hopefully I am not too late to reply. I’ve been experimenting with Clion and have so far gotten it to work just as well as compiling Linux on Mac with xcode. The instructions are very similar, although you will need to make some adjustments. To build UE4 on linux, you will need to first generate the CMakeFile.txt using the “./GenerateProjectFiles.sh” command with the terminal. Afterwards, open the project with Clion. It will then proceed to scan and index the files, once that is done, you will need to configure the build. On the top dropdown menu that shows all the build Targets, first select ShaderCompilerWorker. Configure the settings so that the executable is FakeTarget and the working directory is the root folder of your UnrealEngine. For right now, ignore filling in ProgramArguments field. Next, you want to click the build button and let it finish building ShaderCompilerWorker. It will scan the dependencies and build the module. After it finishes, it says that it will begin scanning for dependencies for FakeTarget. At this point, you can go ahead and click the stop button (near bottom left corner red square button). This will stop the build and let you continue onto the next step. Once it stops, go back to the top drop down menu and select UE4Editor. Then Edit the Configurations, you will again need to put the same settings from before. Select FakeTarget as executable, directory as your UnrealEngine root folder. Leave ProgramArgument empty for right now. Then start the build. It will finish and you will need to stop the build once it starts scanning dependencies for FakeTarget. Finally, once the build is stopped, go back to edit configurations for UE4Editor and change the executable to UE4Editor found in /Engine/Binaries/Linux. Then change the ProgramArgument to “/Engine/Binaries/Linux/UE4Editor”. I have found that not using quotations will give you a warning, but the warning does not affect the outcome. If you want to build and compile your project, then you must, either use this command or create the CmakeFile from the editor. To create the CmakeFile from the editor, go to plugins and make sure that CLion is turned on. Afterwards, go to your Editor Preferences, select the “Source Code” tab, and in the dropdown menu select CLion. Lastly, in the File Menu, you should now see the option to “Refresh Clion”. This will generate the Cmakefiles. Also you will see the option “Open Clion”. Depending on how you installed Clion, to run CLion from the editor you may need to modify the file “Engine/Plugins/Developer/CLionSourceCodeAccess/Source/CLionSourceCodeAcess/Private/CLionSourceCodeAccessor.cpp”. Replace “/opt/clion/bin/clion.sh” with your install location. By following this tutorial it will create a bare bones light UE4 editor. I am not certain if these instructions have equivalent results to those on “the building for Macs” instructions, but I have found that they work and if you need to compile the other modules, you can either follow similar steps to those above or simply compile the rest using the traditional “make” command in the terminal. But this will allow Linux users to build, test, and compile UE4 using the CLion IDE instead of only relying on Visual Studios. I have tested this to work on UE4.15 and UE4.20, will most likely work with all versions in between although the in Editor menus for CLion differ. Thanks for such a nice instruction! Indeed, in the Unreal Editor the menu was updated with 4.20 only, there were also some fixes inside the UE4 code itself. I’ve just converted my project from UE 4.19.2 to 4.21.0 and I am using CLion 2018.3, with the Unreal Engine SDK plugin installed. I have not set CLion as default for Source Editor, but only changed in the editor I’m currently experimenting with. When I choose Open CLion from the file menu in the editor, I first got CLion cannot open “project.sln”. After removing project.sln, the message said “Couldn’t find solution”. Additionally I’m using APlayerController, and when opening the .h file, CLion tells me “the file does not belong to any project target, code insight features might not work properly”. Finally I have a whole bunch of cpp files in my project view (e.g. AbcFile.cpp, AbilityTask_Repeat.cpp, NiagaraNodeReroute.cpp) which I don’t particulary need to see without some option to fold it all away. I’m new to CLion, so might be that I need to brush up on some basic concepts, but these finding came from following this flow that’s why I put them here. 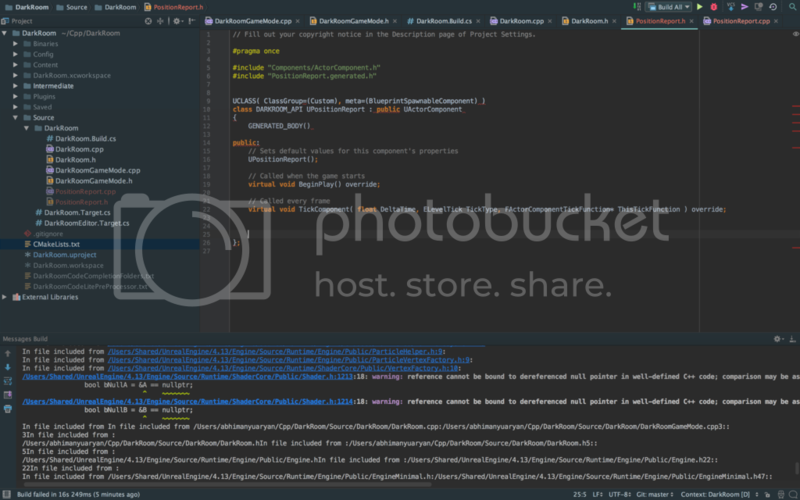 You have to generate CMake project following the instruction in this post. CLion can’t work with .sln files (which is msbuild project model files). Did you manage to load the project successfully? What’s the output in CMake tool window? Hello and thanks for your reply. This is my CMake log. I’ve searched and there are some people who’ve encountered this issue I don’t know it it’s the same thing. Some people said that if you compile the UE4 yourself it doesn’t creates this issue. I’ve compiled it in Linux and didn’t have this problem but I didn’t try to compile it on Windows and I actually don’t believe it can be fixed by something like that. Also the issue will be fixed in MSVC, as far as I know in the upcoming release next year. Yes I’ve tried setting it to release but it didn’t change anything at all. You can see it on the screenshot. Also I didn’t succeed at compiling it on windows. Strictly speaker, compilation and loading fake CMake target (created especially for CLion) has nothing in common. For CMake loading, I’m afraid then nothing can be done before MSVC fixes the issue. CLion simply can’t load the project w/o running the command and collecting compiler information( Sorry for that. Hopefully, MS will issue the fix soon, it’s marked as fixed in the next version in their tracker. Thank you than. I’ll have to try to work with Kdevelop until this issue is fixed.